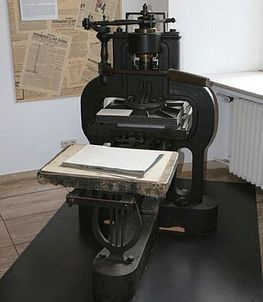 Recently, I have seen a number of printmaking studios purchasing old mechanized printing presses for relief printing. One example is a Vandercook proofing letterpress that uses lead type and oil-based relief inks. There are a number of hazards associated with these mechanized presses that are not found with normal printmaking presses, including getting caught in the moving rollers and the potential lead hazard from the type. These press needs guarding when in operation to prevent people being caught in the rollers during normal operation. Most of the ones I have seen did not have guards. Cleaning the rollers is also a serious hazard if the rollers can not be turned manually. With the Vandercook, for example, much of the press is self-cleaning, but cleaning of the bottom roller is done with the press operating. This is very dangerous since fingers and hands can get trapped in the rollers, and is a violation of the OSHA lockout/tagout standard which requires that dangerous machinery be turned off and locked out for maintenance (see article on Lockout/Tagout). The following describes a procedure for cleaning the press that is approved by OSHA. It involves inching the press to the area to be cleaned, stopping the press, locking it (i.e., installing a lock so that the press cannot be turned on until the lock is removed), cleaning the section, removing the lock, and repeating this process with a new section of the roller to be cleaned. This procedure must be in writing according to the OSHA lockout/tagout standard. 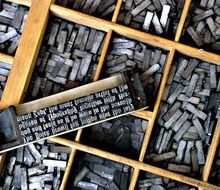 Lead type oxidizes when exposed to air, producing a thin layer of lead oxide dust which can collect in the type drawers and come off onto hands. In addition type abrasion can produce lead dust. The type drawers should be of plastic or some surface easy to wash, and should have a lid to minimize exposure to air. did you know? Since the early 1990 many industries have begun to substitute products made from lead and antimony with non-toxic alternatives made from Bismuth alloys. Some companies started recasting metal type from Bismuth rather than from lead, caused by concerns over handling lead safely. In fact, Bismuth was the very first metal used for type setting in the late 15th century. The type and type drawer should be vacuumed with a HEPA vacuum cleaner and washed on a regular basis. The water should be filtered to remove lead dust. After handling lead type, hands should be thoroughly washed. Anyone using the lead type on a regular basis should have an annual blood lead test. Some portions of the OSHA lead standard could be useful as a guide. If disposed of, this type would be considered hazardous waste. Local exhaust ventilation should be provided for press cleaning. An explosion-proof movable exhaust hood can be used at the press. It can also be used for exhausting solvents from the cleaning of type.